Why don’t we start off this short week with a pretty picture? Hopefully everybody had a great holiday weekend and got to enjoy some extra time off! I spent a good portion of the weekend dealing with the 80 pounds of tomatoes I bought from the farmer’s market. Yeah, I sort of overestimated how many pounds of tomatoes I would need to can enough diced tomatoes and tomato paste to last through the winter. But all is well as I found ways to deal with the extra 20 pounds! This bedroom is nothing like my bedroom now, but I love it. It’s perhaps a tad too feminine for me, what with the ruffled bedskirt and mirrored side table, but I still love it. It’s simple, clean and inviting. My favorite part of this room is a toss-up between the rug and the bedframe…with the chandelier running close behind. I find as I gain more experience as a designer, my tastes are really broadening. I used to only like ultra clean lined furniture and spaces. I would have said I loved modern design and was okay with most transitional design items. But now, I find I’m attracted to all sorts of styles. Five years ago I never thought I’d be someone who could fall in love with such a traditional looking space. Things sure have changed for me, but I think it’s great. One piece of design advice I’d love to share with everyone I meet is that we shouldn’t limit ourselves to one style or to what we think we should like. Like what you like, no matter what the style. Embrace who you are. You’ll be better off for it. I’m a sucker for vases. 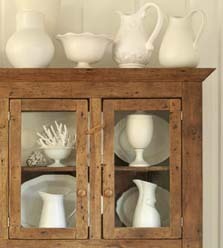 I especially love when vases of different shapes and sizes are grouped together. 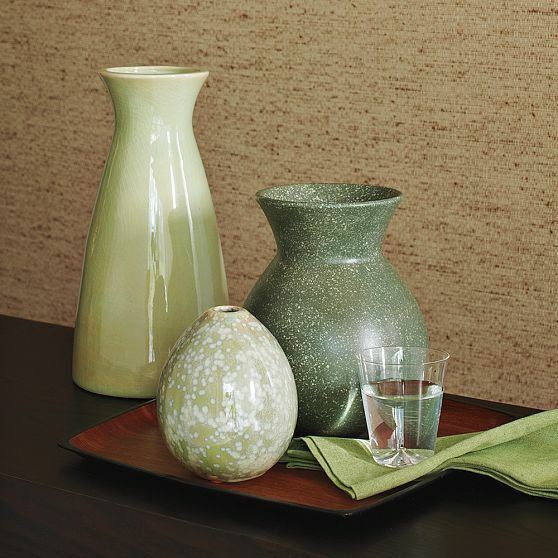 I find I’m often lamenting the fact that I have very few surfaces in my house on which to put said groups of vases. Which means, more often than not, I can be found in a store gently setting a vase back down on the shelf, reminding myself that I have no place for it. Sure, sure, I could just buy it and put it in “rotation”. But I’ve found that as soon as I put an item away in a box or a closet, for use “later”, I’ll just forget about it. So instead, I just look at all the vases and vessels and containers that I want to buy and hope someday I have a house with places to put them all! But if you’re not into the white, they have so many more collections…and I want them all! Which collection is your favorite? I’ve been noticing a lot of yellow popping up on design blogs over the past week or two. It really is a beautiful color…although one that I often ignore. Interestingly enough, on the last two design projects Kim and I worked on, yellow ended up being the last minute accent color. Once in a throw pillow and the other time in a throw blanket. The projects had completely different color palettes, but somehow yellow just ended up providing the right pop of color in both cases. But this post isn’t even about yellow. Nope, but it is about another equally bright and energetic color: orange. I came across the image below and it got me thinking about how just a little bit of a strong color really brings a space alive and makes it interesting. Just try to imagine the living room without the orange pillow. Still nice, but it becomes much girlier and just a bit dull. The orange really makes the space. To show that it’s not just this room that looks great with orange, here’s a different space. 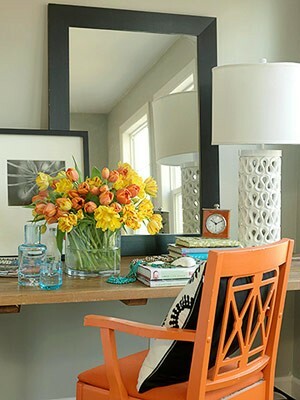 The vase of orange and yellow flowers certainly adds quite the punch to this space, but even without them, the orange chair really makes this vanity unique. If you’re feeling a little bit bold, you may want to think about adding more than just a touch of orange. In this space, a good portion of the furniture is orange and yet it’s not overwhelming. So if you’re thinking that a space in your home is in need of a little bit of a change, you may want to take a look at some orange accents. Stick with small items (pillows, blankets, vases, etc.) and then you can switch them out the next time you feel the need for a change! Moving on « EF… on Planning for…Spring?